Diane Andrews grew up in Phoenix, Arizona. She became a christian through the ministry of Young Life. During her college years, she helped lead a local Young Life Club with her husband Mike Andrews, who is a graduate of Denver Seminary and currently one of the lead pastors at The Rock Community Church. They have two children, ages 30 and 25, and have been married for 35 years. 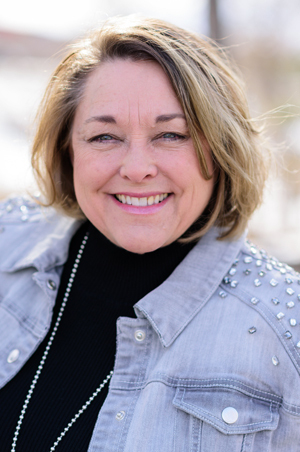 Diane has a passion in helping women to connect with Christ, connect with other women, heal, dream and celebrate through women’s events and retreats. As Diane speaks, her passion for Christ and her open heart will help other women to be more vulnerable, real, and transparent. Diane looks forward to speaking at your event! Contact Diane to speak at your event! Diane has a passion to help women be transformed through a relationship with Christ. Her illustrated teachings help women heal, dream and celebrate who God created them to be. As Diane speaks, her passion for Christ and her open heart will help other women to be more vulnerable, real, and transparent. Her journey of serving Christ started in her college years, helping to lead a Young Life group with her husband Mike Andrews. Along with being a wife of 35 years and a mother of 2, she is also an author and the Founder and Director of R & R Retreats.